Our minds can easily become lost during the frenzy of preparing for the holidays. Holiday shopping, baking cookies, and shoveling snow can all take up a lot of time during the colder months. However, you might want to consider taking additional winter maintenance steps now in order to save you time, energy, and money in the long run. Do not let “after the holidays” become your mantra. Follow these winterization tips to stay safe during the coldest months. This will help ensure that the holidays run as smoothly as possible so everyone can enjoy the festivities, wherever they may be. Nobody likes to discover that they do not have an ice scraper in their car after a snow storm, especially if they are running late for work. In order to prevent this in the future, ensure that your car and/or house is properly stocked with shovels, ice scrapers, and chemicals for melting ice. Remove all items in the yard including rakes, hoses, lawn mowers, and leaf blowers. The last thing you want is to find them frozen to the ground, not to mention the possibility of people tripping on them. You may not even see them again for a few months! Be sure to read on for more tips about how you can safely winterize your home to ensure the smoothest transition for you and your loved ones. Salt the sidewalks and driveway. Be sure to properly remove ice by sprinkling salt on your walkway as well as the driveway as it is easy for pedestrians to slip and fall. Shut off outdoor faucets. In order to avoid frozen and burst pipes, it is best to turn these off for the winter. These can include garden, hot tub, and pool hoses. Be sure to drain any remaining water in addition to turning off the main water valve. This is one of the most important steps to take when winterizing your home. It is essential to check the roof for any loose or missing shingles as this can easily create a water leak. Especially in the spring, water will seep into the cracks and/or hole as the snow melts off the top of the house, creating water damage. This also creates the risk for mold growth if left for too long. In the event of water damage, you will need to call a professional water damage restoration service. Shut all vents and crawl spaces. In order to save on your energy bill during the colder months, close your vents and crawl spaces. This will prevent cold air, not to mention critters, from finding their way into your home. Prevent the buildup of ice. Icicles are always hard to avoid throughout the winter. 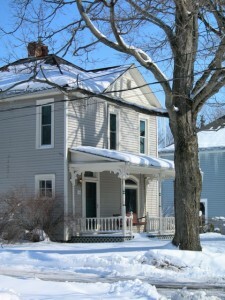 However, there are steps to take in order to prevent unnecessary ice dams on your roof. Be sure to create proper ventilation through your home to avoid the buildup of moisture. In addition, patch any air leaks in the roof. This will help avoid water damage by preventing the buildup of ice in the gutters and downspouts, as well as on your roof. Test all smoke alarms. There is nothing like reading a good book and sitting next to the fire during the winter. If you expect to use your fireplace frequently, be sure to check all smoke alarms to ensure they are working properly. With over 47,000 house fires each year, a simple step now can ensure your safety in the long run. Have the chimney inspected. Before using your fireplace, be sure to call a chimney sweep professional. They will inspect the inside of the chimney and remove the buildup of any flammable creosote. This is just as important as checking the smoke alarms as this can ensure the safety of you and your loved ones in the future. Inspect the HVAC system. A professional inspection of the ductwork in your heating system will ensure proper, safe circulation throughout your home. Checking the indoor air quality for carbon monoxide or other deadly chemicals (and removing them) will ensure the safety of you and your family throughout the winter. Replace the HVAC filters. With normal use, HVAC filters should be changed generally every 6 – 12 months. However, if your home has pets or people with allergies, they may need more frequent maintenance. Changing the air filters will ensure that the air is clear of dust and ash from the chimney as well as other debris. Be sure to check this regularly for those with allergies or other respiratory problems living in your home. Secure all exposed pipes. As the ice may cause cracks and leaks in your pipes, be sure to wrap them properly before they are hit by the cold. This helps prevent them from freezing and becoming a bigger problem in the future. Test the sump pump. As all sump pumps may vary, be sure to check the owner’s manual for testing to have it ready if the snow melts during a warmer winter day. As you can see, taking simple measures today to winterize your home can ensure the protection and safety for you and your loved ones down the road. However, there is always the chance that an accident does happen. In these cases, it is best to call a professional restoration service. ServiceMaster DAK ensures a quick and timely cleanup with our 24/7/365 service. From water damage restoration to upholstery cleaning services, you can count on us to fix any damage your house has incurred throughout the winter months.